MiShel Designs: One Crayon Color- What Am I? 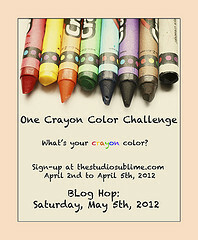 One Crayon Color- What Am I? came up with a challenge for us. using the Crayon Color of our choice. where the dolphins roam free. where the birdies all fly. I'm the soft, pretty sweater that you love best. Why yes, I am the color BLUE! Yep ~ I chose BLUE. but we had to try and create with just that color. what color/shade/hue of Blue to create in. while creating in my absolute, all-time favorite color! There's quite a few different colors of BLUE in this photo. I had a ton of fun, can you tell?!! Blue is the color associated with the Throat Chakra. 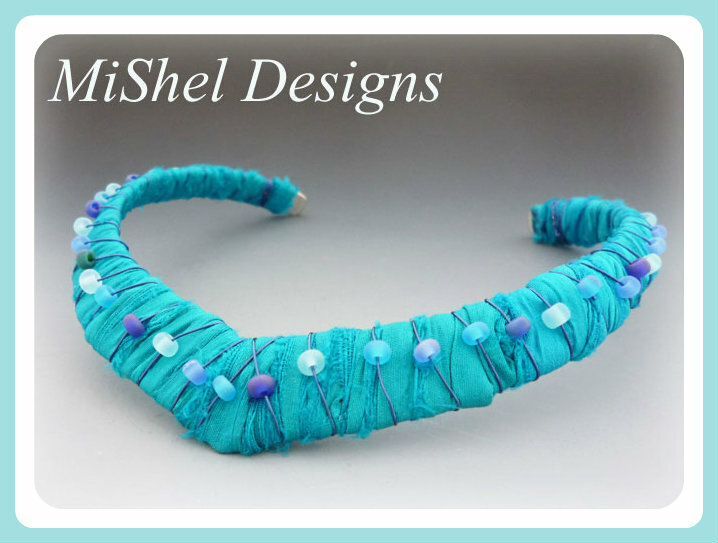 Blue is believed to symbolize youth, spirituality, truth and peace. Turquoise promotes intuition and is the color of communication. 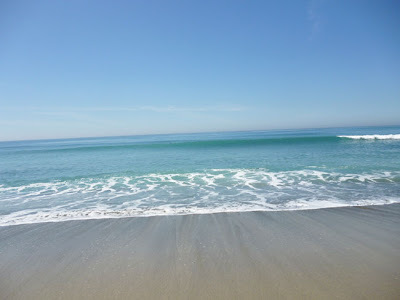 Blue gives us a feeling of distance and allows us to "look beyond"
and increase our perspective outward. It is said that this is why artist use it to show perspective. 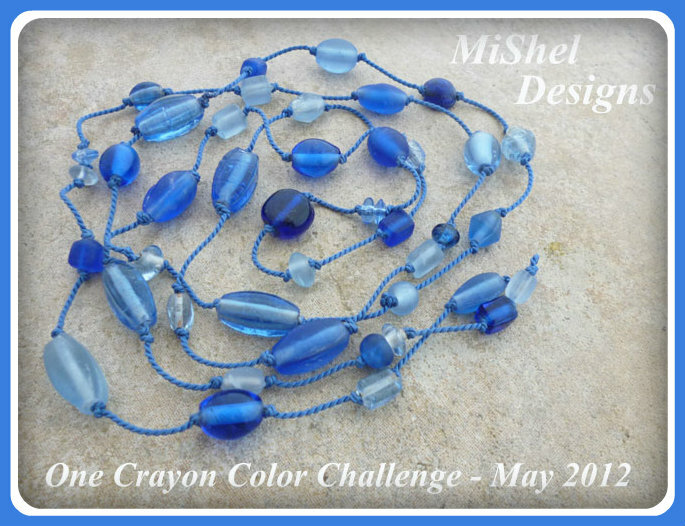 wonderful challenge and blog hop! It's really stretched my imagination! 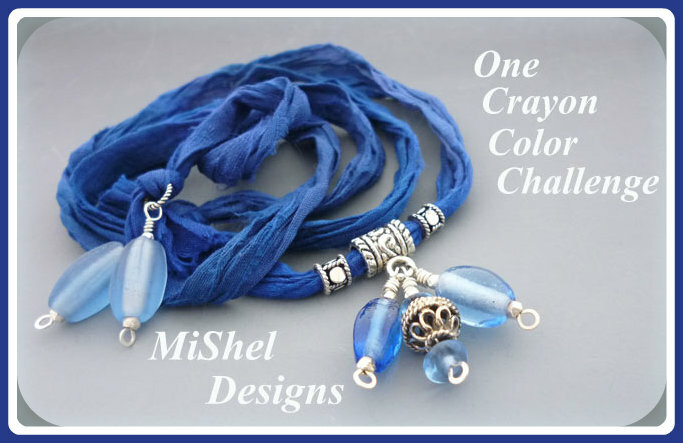 Peace, Love and Shades of BLUE! Oh, and happy Cinco De Mayo today, too!! Really? You had fun? Oh my you did. I love the silk necklace and wrapped earrings...and then there is more?? You have me laughing at feeling blue! I love your work! Your inspiration photo is truly that - inspiring! 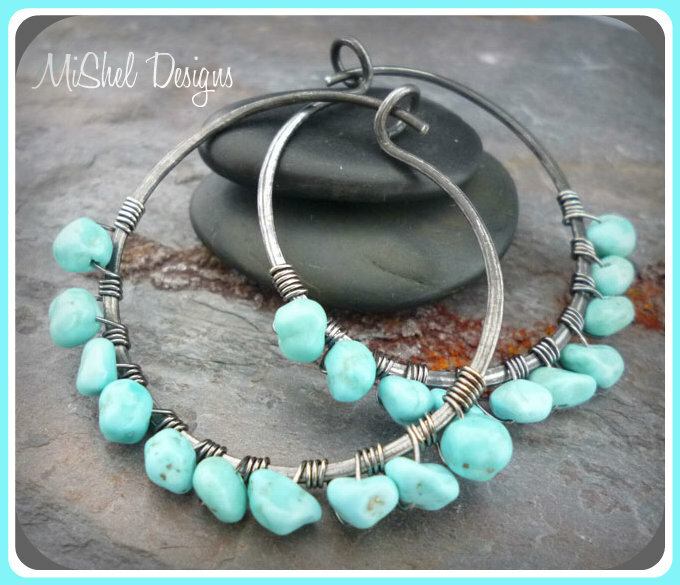 While I love every single design, the turquoise earrings are G.O.R.G.E.O.U.S! You put so much thought into your post - a joy to read! Beautiful! Love all of your blue pieces. Hard to pick a favorite. I'm loving the first two pair of earrings though. Would love to try my hand at those. Very cool. Ok now those are just gorgeous! Each and every one of them! I love the style of them ... they would look fantastic with some flowing, gauze dress walking the beach. Wonderful inspiration! Wow! You created an entire collection...I love the turquoise collar necklace. 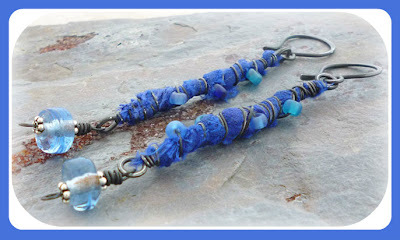 And the blue silk wrapped earrings. I guess those two pieces are my favorite, but everything is just gorgeous. Great job! I love your inspiration photo for this challenge it is gorgeous. All of you pieces are just as gorgeous as the photo. I love the first necklace it speaks to me. 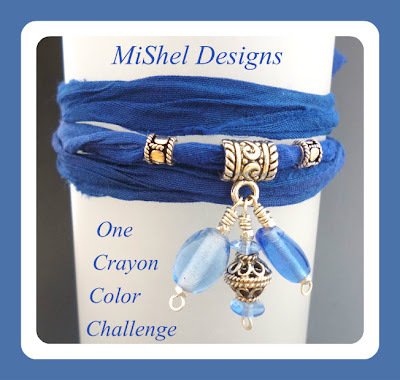 I love the photo you have and each piece of your 'blue' jewelry. Love the wire wrap/sari silk earrings. You certainly look like you had fun with this challenge! Blue is definitely your color. 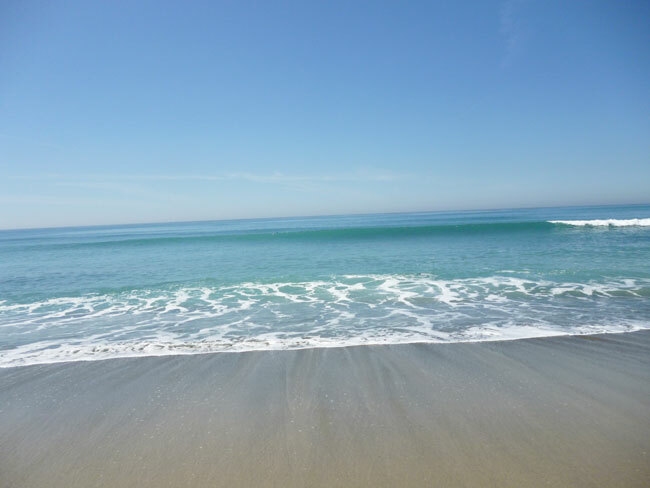 :) I had to smile at your inspiration photo because the ocean is one of my favorite starting points as well. You went wild! I love the variety of styles you have, with fiber and beading and all of those pretty beads. I didn't know about the chakra, either. Cool info! Wow, you made so many fantastic pieces! I love all the different designs,colors and textures. I think my favorites would be those earrings--both of them. I'll bet they look lovely on. WOW! Talk about cool in blue! Shel, your creations are beautiful!! My eyes went right to those earring with the wrapped fiber! LOVE!! Thank you so much for playing with me!!! Seriously though, your pieces are all so great. That collar is an eye-catcher for sure, but I'm in love with each and every pair of earrings you created. In all, you really conquered blue!! Those are all amazing. I really liked the sari wrapped choker and the earrings .. and the sari earrings .. and the sari necklace. I am just in awe over everything you created. Wow, so many different ways of using blue! These are all so lovely, I couldn't choose my favourite! I can see why you chose blue, it clearly speaks to you and I love all your designs. And yes, I am drooling over the blue pearls, stunning!!! Your inspiration picture is beautiful. Every single piece speaks to the same calm, color, beauty, and joy that draws us to the ocean. I loved each one - well done! Wow Shel, those are the most beautiful blues I've ever seen all in one place like that! I normally merely "like" the color blue, but you have me lovin' it today! Your designs are all beautiful ... but that first pair of earrings are my fave! Gorgeous!!!! 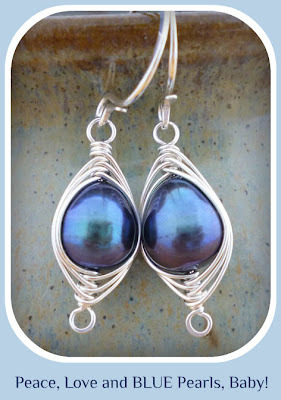 I love the look of the wire wrapped over the fabric pieces. That is so unique! Hi Shel, thanks for visiting and your comment. Love the blue jewelry, looks like you really had fun. Love the sari silk in varying shades of blue. My favorites are the turquoise nugget earrings. They are lovely. Have a great week. Oh MY! They are ALL so yummy! I love the first necklace, and the earrings are so great! So very pretty! Love them all! What beautiful work! You definitely do love blue! The long earrings with that gorgeous ribbon are my favourites. Love all of your pieces - but especially the two pairs of earrings! Hi my fellow SG design team member! Sorry I am so late! Heavens you had quite an array of blue, well done! My favorites, hands down, the turquoise wrapped hoops. Delicious. I am calling this the Shel Collection of Blue Awesomeness! Each and every design is just lovely!